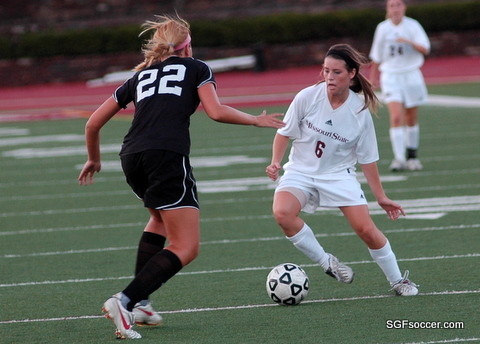 The Missouri State women’s soccer wrapped up the exhibition slate with a 2-0 loss at Saint Louis on Saturday night. The Billikens got a pair of late goals to spoil a solid second outing by the Bears. That’s Shelby Stewart (Parkview) featured at right. Alix Opfer (Glendale) started and played the full 90 in a solid outing although the second goal came as she was left alone with her goalkeeper on the second goal. Kelsey Goff had the best opportunity, early in the second half, denied by a great reaction save by the Billiken’s senior keeper. Slideshow – click on any photo to be taken to the Gallery. Your photo purchase helps to support this website. Thank you! The Lady Bears opened their Spring season this afternoon with 90 minutes of soccer on the fast and windy Plaster Stadium pitch. Facing off against D2 Missouri S&T, the Spring season allows the teams to work on some projects and take out their energy against another team rather than their teammates. Working in three 30 minute sessions, the first two were scoreless and offered a few insights into what the projects might be. I’ll comment on the Miner’s first, then the Lady Bears. The Miner’s came out strong this afternoon, working hard to go forward and pressure the Bear’s. Reflective of the strong season they had in the Fall, when they reached the GLVC Playoff’s for the first time ever, the ladies worked the ball well. The team lost four key seniors from that run but return a strong core led by seniors to be Melissa Young (M/F), Paige Smothers (D) and Stacy Luquette who takes over the starting role in goal. 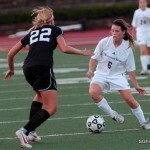 Junior-to-be Colleen Lewis is the midfield general and she’d fit in well on the Bears. The Bear’s lost seniors Jordan Reppell and Sarah Linsin from the backline that took them to the MVC Final last year. It appears they have also lost freshman Brooke Williams from the State Champion Liberty Jay’s, who was the most dangerous player on the pitch for them once Rachel Weimer went down injured. Freshman Tiffany Laughlin may be called on to play the same role for the Bears she did for the Pattonville when she moved to the back line as a senior for the 2nd Place Pirates. In the middle I like junior Jesslyne McGrath’s calm under pressure and Adrianne Kalogerou also worked well in the outside defensive position. 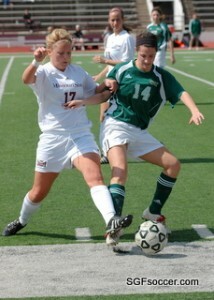 Lauren Wendt showed good positioning and the ability to get to the goal. All three Springfield players got in plenty of minutes (Bailes, Roberts, Stewart) with Bailes starting in central midfield and Roberts at an outside midfield position. OMAHA, Neb. – The Missouri State women’s soccer team (10-6-3, 4-1-1) battled the top-seeded Creighton Bluejays (15-3-2, 5-1-0) into overtime of the MVC Tournament Championship match in Omaha, Neb. on Sunday afternoon. 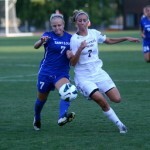 Creighton’s Erin Gunther scored on a penalty kick in the 98th minute to give the Bluejays the title and a 2-1 win. Tara Bailes hit crossbar with Bears’ first shot in the 11th minute of play. Missouri State would record the first four shots in the match. 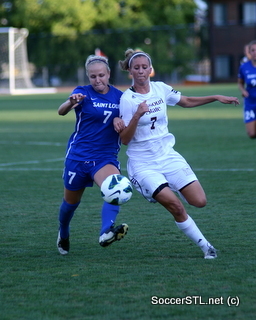 But Creighton’s Beth Fyles converted a fast break for the Bluejays in the 25th minute to put MSU in a 0-1 hole. Missouri State had the better play in the first half. The Bears outshot the Jays seven to four in the half. Despite allowing two corners to Creighton, the MSU defense was stout for most of the period. The Bears kept on the pressure registering four of the first six shots in the second half. In the 74th minute, the match would take on a new perspective. Freshman Ashley Washburn received a feed from Nia Williams. Washburn drilled a bending shot into the upper left corner of the net to bring the match all-square at a goal apiece. The goal was Washburn’s first collegiate tally. 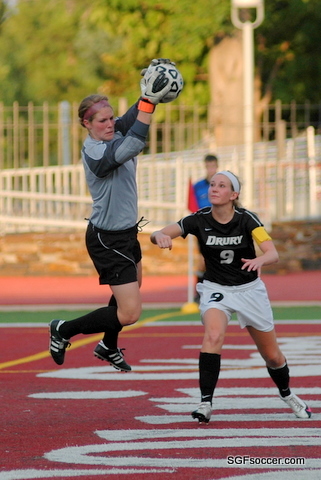 The teams headed to overtime tied at 1-1, where Jessica Teahan made arguably her best save of the season. She had to change directions and make a diving stop on a deflection of an Emily Orbell shot in the 97th minute. All told, Teahan made six saves in the match for the Bears. The Bears outshot Creighton 15 to 12 in the match. Tara Bailes led the way for MSU with four shots. Katelyn Frederickson, Tiffany Laughlin, Shelby Stewart and Washburn tallied two shots apiece. The MVC Tournament Finals appearance was the Bears fourth in team history. Missouri State reached the finals in 1999, 2000 and 2001, winning the title in 2000. It was the Bears’ seventh overtime match of the year and second-straight in this year’s MVC Tournament. 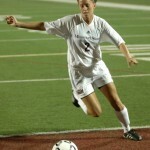 NORMAL, Ill. – The Missouri State women’s soccer team (8-4-2, 2-0-1) battled the preseason conference favorite Illinois State (5-6-1, 1-1-1) to a scoreless draw in Normal, Ill., on Sunday afternoon. 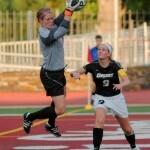 Missouri State junior goalkeeper Jessica Teahan saved all six shots she faced. The shutout is her fourth of the season and 11th of her career moving her into sole possession of third place on the all-time Missouri State list. The clean sheet is the third in a row for the Bears and seventh of the season. The Bears defense was able to shut out the Redbirds despite being outshot 26 to five. Missouri State was also able to extinguish nine corners by Illinois State. Offensively, four of the Bears’ five shots were on net. The best scoring opportunity for Missouri State came in the 87th minute as Shelby Stewart’s shot resulted in the best save for ISU’s keeper. Katelyn Frederickson, Brooke Williams and Nia Williams registered the other shots on goal for MSU. DENTON, Texas – The Missouri State women’s soccer team dropped its season opening match at North Texas, 2-1, this afternoon in Denton, Texas. With temperatures near 100 degrees and heat indices even higher, the Bears battled the Mean Green and the elements to open the season. It didn’t take the Bears long as freshman Brooke Williams put Missouri State ahead in just the second minute of play. The Bears got a breakout and sophomore Rachel Weimer centered a feed to Williams who ended up one-on-one with the Mean Green keeper. Williams was able to slide the ball past the keeper inside the back post to give Missouri State a 1-0 lead. North Texas got the equalizer in the 16th minute when Michelle Young made a great run in on net and beat Missouri State goalkeeper Jessica Teahan. UNT’s Julie Lackey would get the game winner in the 75th minute off a free kick. Brooke Williams had two of the three shots for the Bears with fellow freshman Shelby Stewart registering the other. UNT outshot Missouri State 12 to three in shots for the match.